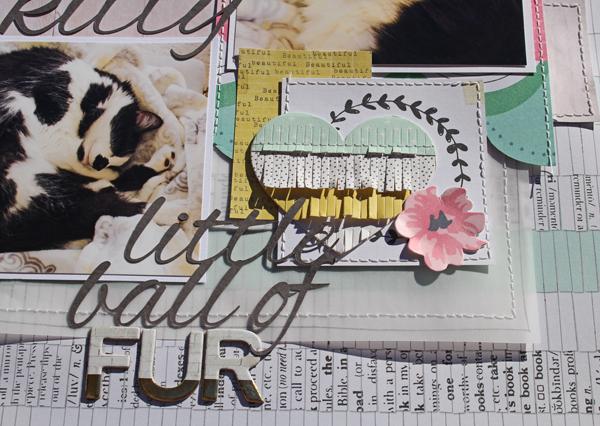 Today is Sketchy Thursday at Scraptastic Club so I hope you will be inspired to play along. For my layout I used the "Gale Song" kit and Add on kit . I wish the title alphas would behave for photos because the lower half of each letter is a beautiful gold foil but they just photograph as black. Believe me they are just awesome alphas. I decided because of the way my photos were taken that I needed to flip the sketch and in place of the circles I have my title along that portion of the page. I have been wanting to use this title for awhile. It sure takes up alot of space. I cut half of the title from the charcoal cardstock in the kit. Don't you just love this little fringy heart! there are 4 in this kit. This is fabulous - you had me singing along with your title.